The Prep Wife: What's Your Bubble? I woke up this morning and, like any morning, I stepped into my bubble. 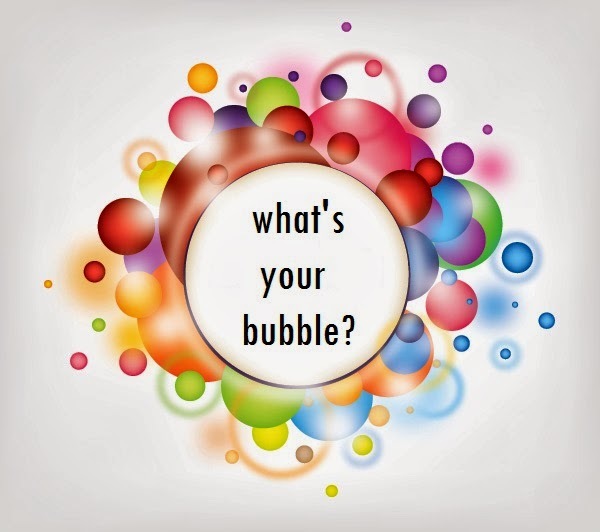 I have many bubbles: happy bubble, sad bubble, b*tch bubble, super-confident bubble, ambitious bubble, optimistic bubble, pessimistic bubble, weak bubble, etc. I also have an I'm-not-sure-what-bubble-this-is bubble. You probably don't know it but you're in a bubble too. We all have bubbles. Some are strong and are like shields; others are weaker and can burst. You see, yesterday I woke up feeling pretty normal. It was just a regular day. I wasn't feeling especially weak or sad but as the hours went by, I felt more and more susceptible to the things around me. Nothing dramatic happened but my bubble was weak. Usually, when small, insignificant but somewhat upsetting things happen, we bounce back up. Not me, not yesterday. Yesterday, every tiny, insignificant thing seemed to weigh a ton. It did not take long for my bubble to be pierced. By the end of the day, I was in my pessimistic, sad and weak bubble and I couldn't get out of it. I did not have my strong bubble to shield me and protect me from the day's ups and downs. In any given conversation, you'll hear me say "I should blog about this!" and then I take out my little notebook and scribble down a few words. When I wasn't feeling at my best yesterday, I thought "I should really blog about this. Maybe I'll talk/write my way into a better mood." I have already mentioned that this blog is therapeutic and sometimes I become more convinced of it. I treat this blog kind of like most people treat their Facebook statuses: like a diary (more or less). I can just imagine some of you readers thinking "A blog is not a diary." When I wrote this blog post, I thought I shouldn't publish it. I thought people don't want to read a diary and they don't want to hear about the ups and downs of my day. Then I remembered that, in my first post, I had said that this blog will be relatable and honest. So here it is and here I am: completely honest and hopefully relatable (I know some of you can relate. We all have our "off" days like I did yesterday). And to all of you still thinking "a blog is not a diary", I welcome you to burst whatever bubble you're in and have an open mind. I know this sounds weird but next time you feel sad, angry or upset, pop and step out of that negative bubble and step into your happy and strong bubble and don't let anyone or anything burst it! 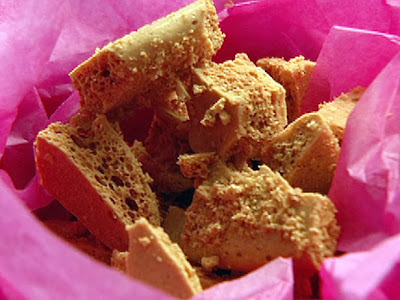 Here's a bubbly recipe for you to try: Hokey Pokey (or Honeycomb). I find this recipe has a lot of charm and is very romantic. With an end result of glistening, golden shards of sweetness filled with tiny bubbles, how can it not be romantic? Imagine crumbling these sparkly, golden bubbles on vanilla ice cream or eat it as is (drizzled with chocolate if desired). Do you know the chocolate CRUNCHIE? It's the crunchy, yellow part. The recipe is Nigella Lawson's. She calls it Hokey Pokey so I'll call it Hokey Pokey as well! *If you want chocolate, melt the chocolate chips in the microwave or on a double broiler and drizzle on top. Once it's set, bash the honey pokey into big golden shards.